The centerpiece of a new quilt for the Chester County Conference and Visitors Bureau was inspired by a historic photograph of what was once the Longwood Progressive Meeting, a hub for abolitionists. 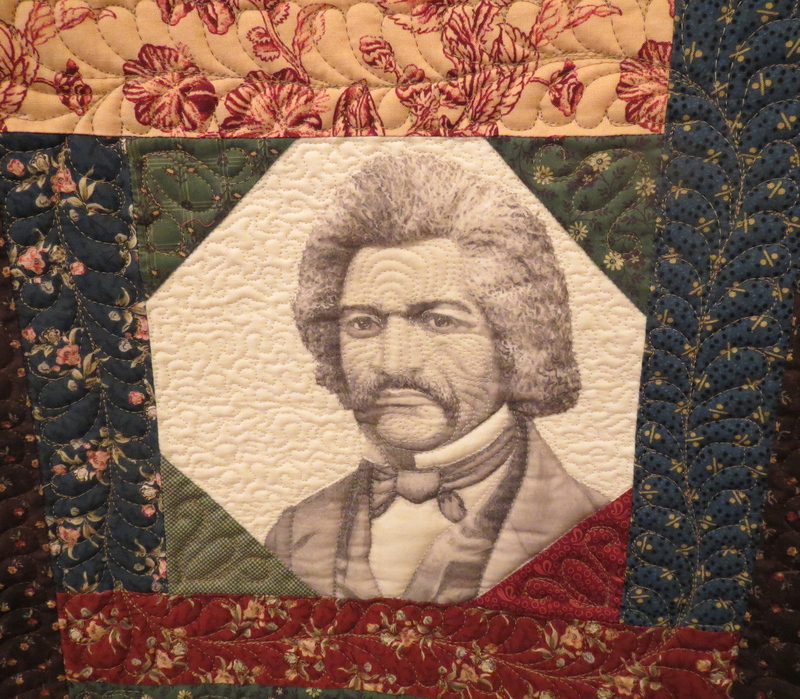 Commissioned a year ago to create a quilt with an Underground Railroad theme, a scrappy group of material mavens delivered the results earlier this month to the Brandywine Valley Tourism Information Center. Frederick Douglass, whose image was transferred to fabric, was one of the speakers at the former Longwood Progressive Meeting. Kelly said the quilters worked from an old photograph of the 1855 building, once a Quaker meetinghouse that served as a hub for abolitionists. The former Longwood Progressive Meeting was renovated in 2012 and now houses the agency’s administrative staff. 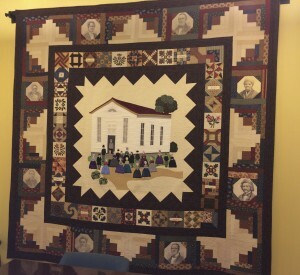 Using an interpretation of the photo as the centerpiece, the creators incorporated authentic quilting block patterns and colors of the time with smaller photos depicting some of the famous people who spoke at the meetinghouse, including Sojourner Truth, Susan B. Anthony and Frederick Douglass. Those photos were transferred to fabric, where the quilters then worked their magic, giving the portraits definition and texture. Mahoney made the request for the quilt after the Brandywine Circle Quilters had created a series of exquisitely crafted fabric tableaus that depict seasons or themes at Longwood – Christmas, light, sounds, and pollination. Those quilts were commissioned and owned by Longwood, but are on display at the information center. 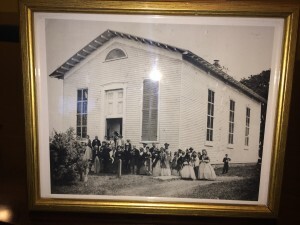 The quilters used a historic photo to inspire the centerpiece of the project. The bureau began leasing the former meetinghouse from Longwood Gardens as a tourist information center in 1989. Mahoney said that the center’s visitor traffic and proximity to Longwood – on Greenwood Road near the gardens’ entrance – made it an ideal permanent display spot for the quilts, a view that Longwood fortunately shared. Now visitors to the center will be able to view the Underground Railroad-themed quilt as well. It is signed by its contributors: Nancy Byers, Carol Forsythe, Nancy Hiss, Cheryl Kusko, Ann Randolph, Joan Scone, Jane Shea, Kathy Silvon, and Takako Pike. Kelly said that when the stellar seamstresses learned that Mahoney was about to retire, they also crafted a smaller version of the quilt that he’ll be able to take with him. “They really thought of everything,” said Kelly. Founded in 1963, the Chester County Conference and Visitors Bureau is an independent nonprofit that serves as the official tourism promotion agency for Chester County – and a premier quilt-viewing venue. The tourist center, 300 Greenwood Road, is open daily from 9 a.m. to 5 p.m. It features brochures, menus, maps and tips on local attractions. For more information, visit www.BrandywineValley.com.